After a day in Valparaiso and a quick pass through the Casablanca Valley wine country (more on that in Part 1 of my Chile travelogue), we were back in Santiago for a couple days. It is a big, sprawling city, which became more manageable as we got a sense of its neighborhoods: the relatively quiet, low-scale, Barrio Lastarria, whose European architecture reminded me of San Sebastian, Spain; the funky, bohemian Barrio Bellavista; the bustling business district around the Palacio de la Moneda; the towering high-rises and shiny new shopping malls of Providencia; the über-posh, almost Beverly Hills-like Vitacura neighborhood where Boragó restaurant resides; the bucolic stretch of shops and cafés in the Barrio Italia. We made our home base at the Lastarria Boutique Hotel, a really nice modern refurbishment of a big 1920's house on a Lastarria side street. 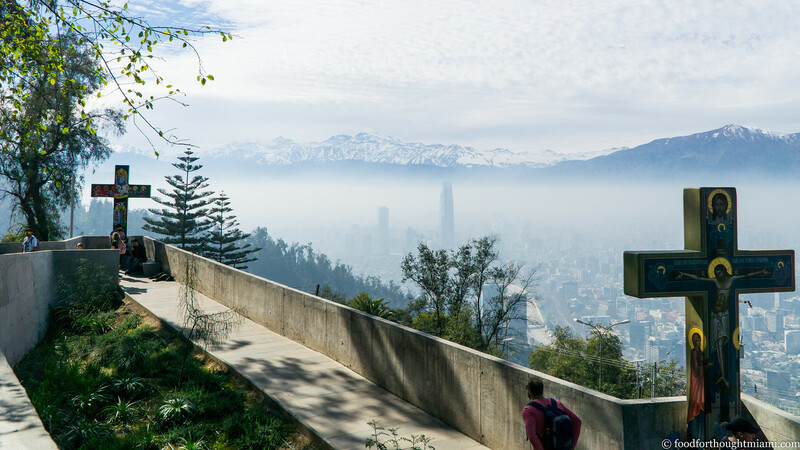 Most of the high-end chain hotels are in Providencia or nearby Las Condes, but we liked this location: not as generically big-city, closer to the museums, and a ten-minute walk through Bellavista to the Parque Metropolitano which surrounds Cerro San Cristóbal. After checking in and dropping our bags, we made our way over to the Plaza de Armas – the original city center. 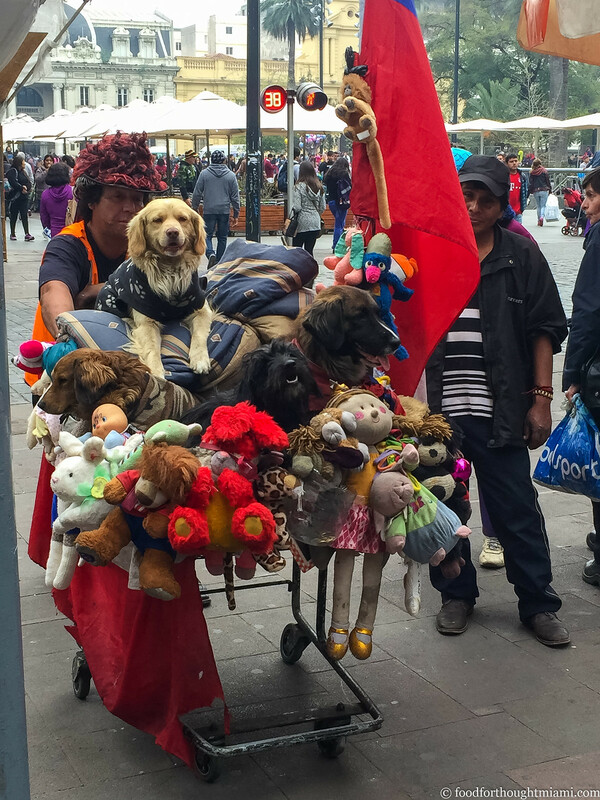 The plaza was packed: with entertainers hustling for tips, with crowds cheering them on, with merchants set up along the street, and with – well, a grocery cart being pushed by a couple Peruvian guys, filled with an odd assortment of stuffed animals and no less than four dogs, all of whom seemed perfectly happy with the arrangement. 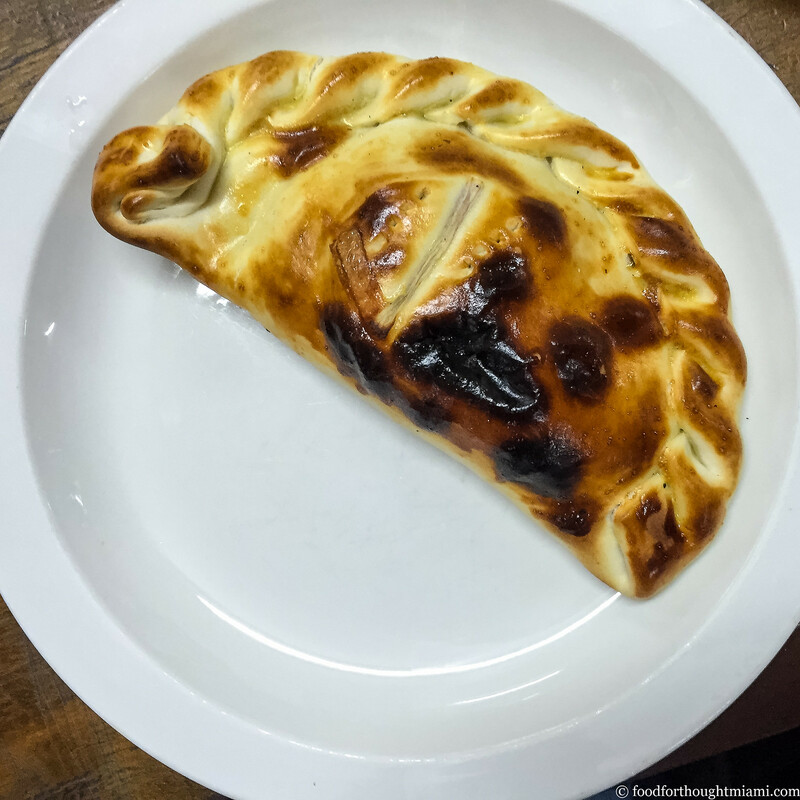 Many Santiago restaurants are closed on Sundays, but we found a spot along Calle Monjitas which had an assortment of different empanadas all made and baked in-house, including this one stuffed with shrimp and cheese. Nearby is the Museo Chileno de Arte Precolombino, which houses a great collection of pre-Columbian artworks and artifacts. 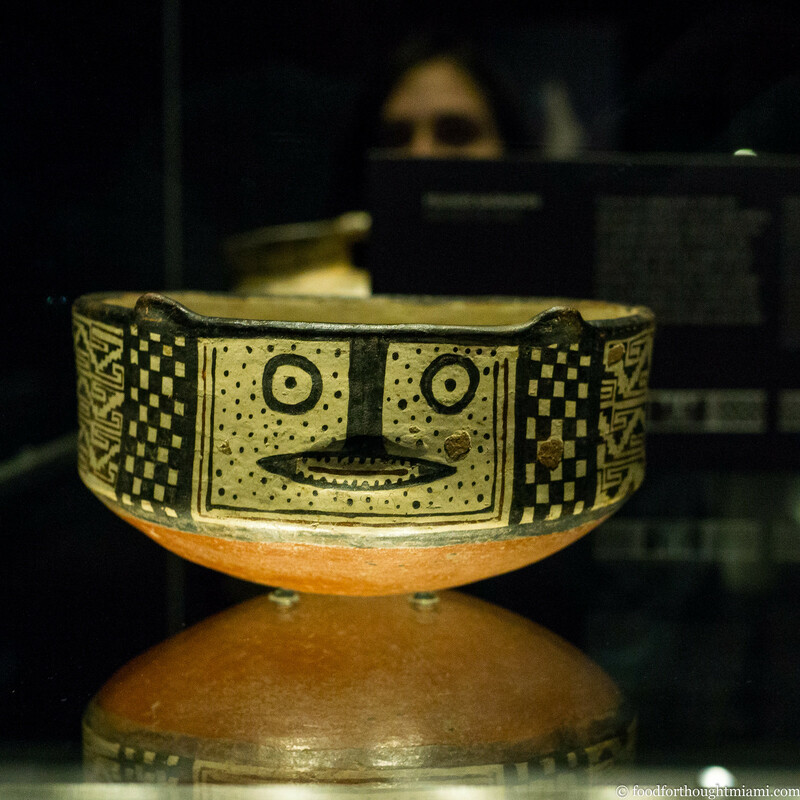 One floor displays items from the different regions and cultures of Chile, like this cat-faced bowl made by the Diaguitas peoples, dating from around 1,000 A.D. Another floor more broadly covers most of South and Central America and the Caribbean. It's a well-organized exhibition that gave history and context to our visit to this region. For dinner, we met up with a friend of Mrs. F and her family at a place called Las Cabras. Though it's right next to the gaudy Costanera Center, a shopping mall-office building complex that includes the tallest building in Latin America, Las Cabras is a modest, no-frills place. It calls itself a "fuente de soda" – a "soda fountain," a Chilean institution much like the U.S.'s mid-century drugstore luncheonettes. 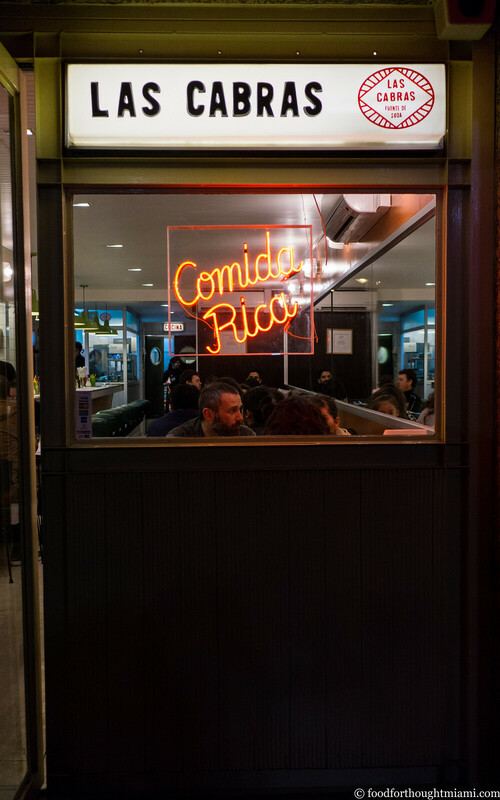 At Las Cabras, Chef Juan Pablo Mellado Arana cooks straightforward Chilean classics, but does it with diligent attention to ingredients and technique – and cocktails, to boot. (For more backstory, there was a good feature in the New York Times last year). 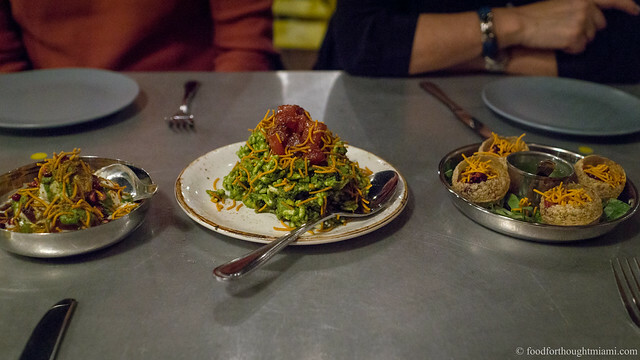 We scooped pebre, a mild salsa of tomatoes, onions, cilantro and chiles, with crusty rolls, and sipped pisco sours, and then shared a palta cardenal, a halved avocado overstuffed with creamy shrimp salad, served over a salad of greens and hard-boiled eggs and olives. We ate charchas de chanco (tender, sticky braised pork cheeks), and beefy lengua (tongue) in a tangy tomato sauce, and a hearty sánguche (sandwich) of grilled churrasco steak. Our Chileno friends approved of the choice. (Unfortunately, it was too dark at our outdoor table for any good photos). The next morning, we crossed over the Mapuche River to the north side of town and took the funicular up Cerro Cristóbal, at the top of which is a sanctuary and a towering statue of the Virgin Mary. 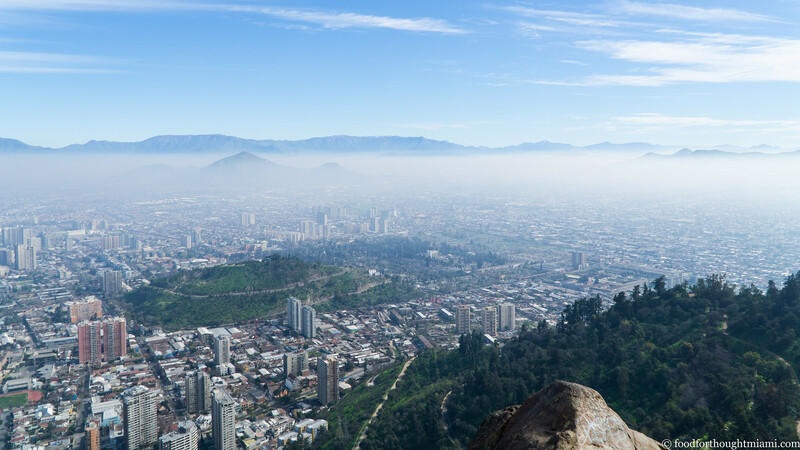 While this spot, with its fantastic views of the city below and the Andes in the distance, is surely a draw all the time, we happened to be there on the Feast of the Assumption, a particularly apropos time for a visit. 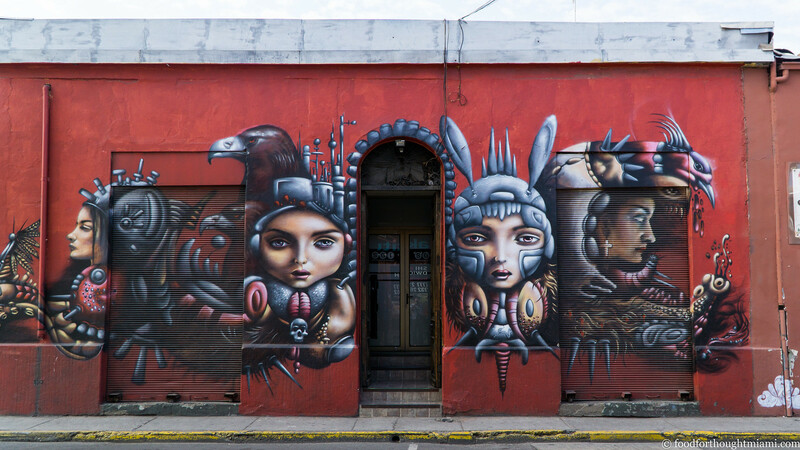 The walk back down the hill took a few hours, leaving us in the Barrio Bellavista, a charmingly scruffy neighborhood with nearly the same volume and diversity of street art as we saw in Valparaiso. 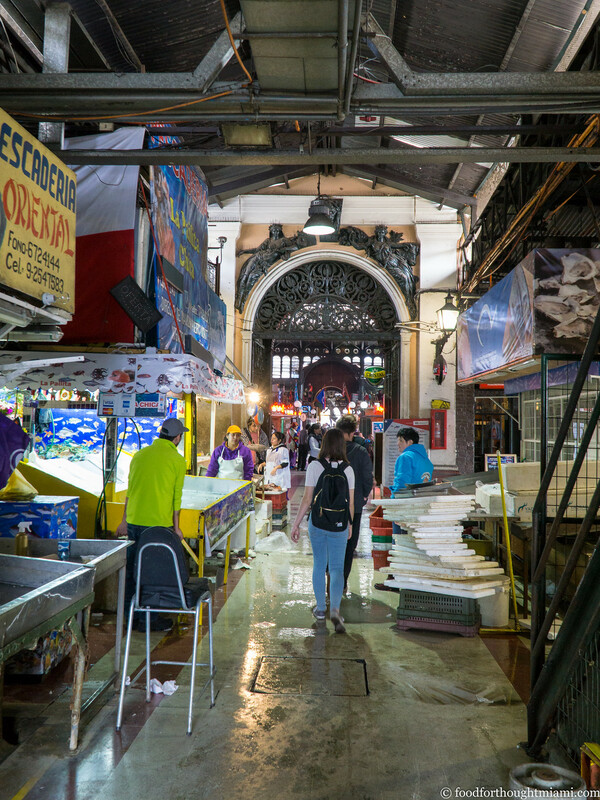 We traversed our way west toward the Mercado Central, a big seafood market which dates back to 1872. Several vendors were selling an assortment of sea creatures that had me scrambling for Google Translate: salmon, and corvina, and conger eel; crabs, octopus, oysters, several different types of mussels; machas (razor clams), caracoles (snails), lapas (limpets), picorocos (barnacles) and erizos (sea urchins). While this is still a working seafood market, the majority of the space is now taken up by restaurants, many of which I warily suspected of being tourist traps. But we were here, and it was lunchtime. The menu at Tio Willy Restaurante Marisqueria, a spot towards the corner away from the main drag, looked reasonably promising, with many of the same items we saw for sale in the stalls just a few yards away. So we took a table and hoped for the best; it turned out just fine. 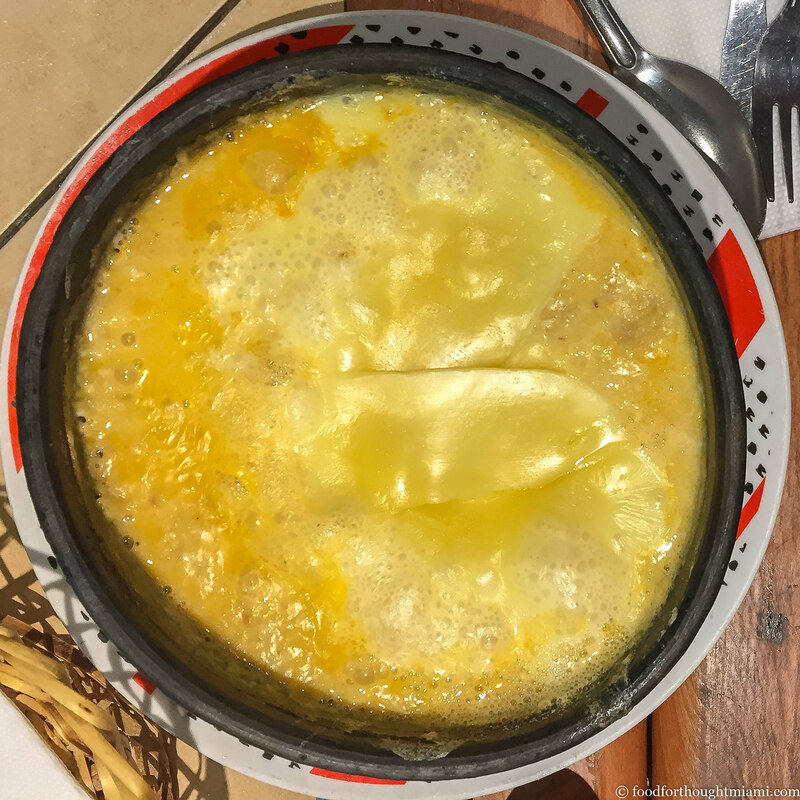 We shared a pastel de jaiba to start: a rich, creamy corn pudding, generously studded with sweet fresh crab (some bits of shell vouched for it being freshly picked), topped with a thin sheet of molten cheese. Frod Jr. followed with Pablo Neruda's beloved caldillo de congrio (pictured above), and while I lack the poetic soul to write an ode in its honor, I can understand the inclination. The conger eel has a firm, gelatinous texture that's reminiscent of monkfish; the broth is heady with the aroma of the sea, and it seems as if it's been simultaneously enriched with some cream and cut with a bit of citrus for some brightness. But what I'm really here for are the erizos: Chilean sea urchin. 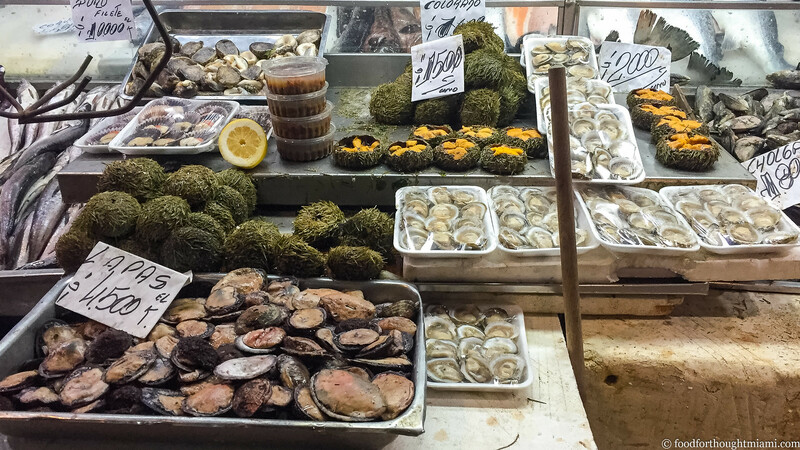 I'm curious why a dish of erizos should cost 8,900 pesos when I can buy a whole sea urchin, opened up with its contents on display, literally a few steps away for 2,000. When my order arrives I understand it's not just to pay for rent and labor: this bowl is filled with literally more sea urchin lobes than I can possibly count, and more than I ever imagined would be consumed in one sitting. This amount of uni would probably cost $100 in a sushi restaurant – here, it's about $13. They're served simply, with just some cut lemons to squeze and a pile of minced onion and cilantro to add to taste. They are not quite as concentrated in flavor as the great Hokkaido bafun uni, or as fruity and bright as Santa Barbara uni, but they are still very good, and in this quantity, incredibly indulgent. Mrs. F's locos con mayo are the only miss. In my last Chile post, I mentioned how these can sometimes be pleasantly firm and chewy, and other times like pencil erasers; well, these were the latter type. 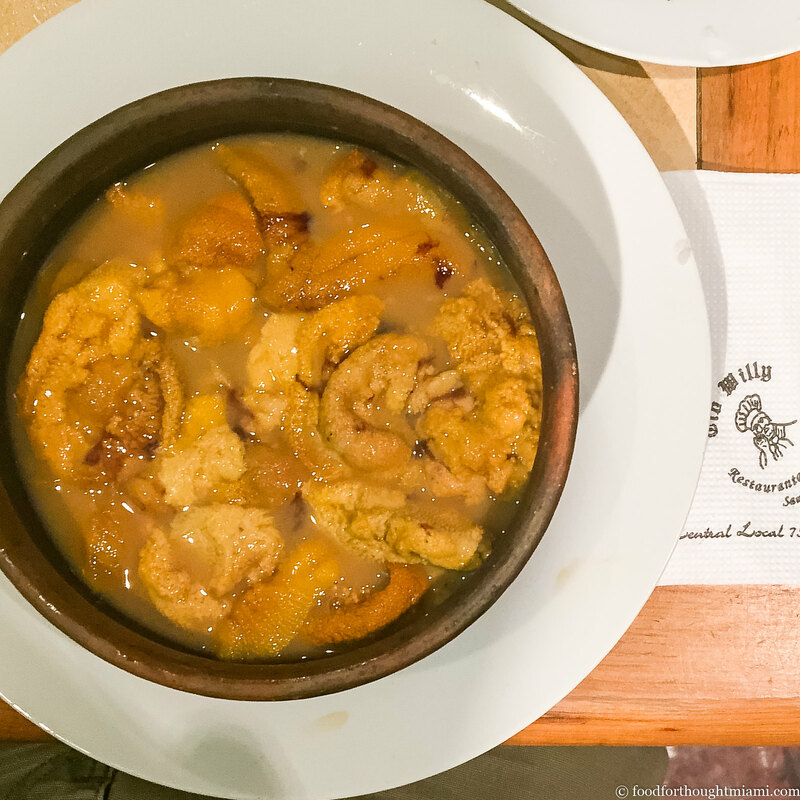 That evening, we had dinner at Boragó, a fascinating meal which I'll unpack in its its own post. When we were in Valparaiso, we visited La Sebastiana, Neruda's house in the hills. 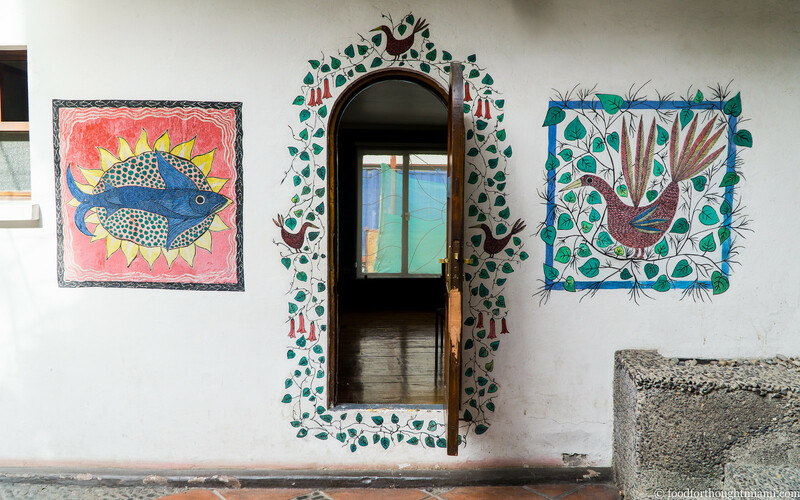 In Santiago, he built La Chascona, a house to share with his then-lover Matilde Urrutia. Like La Sebastiana, the quirky collection of furnishings, objects and artworks which fill the house really capture something of the spirit, sensuality and passion of its owner. (Photography of the interiors of the Neruda houses is prohibited; you can get a peek in this beautiful New York Times piece). 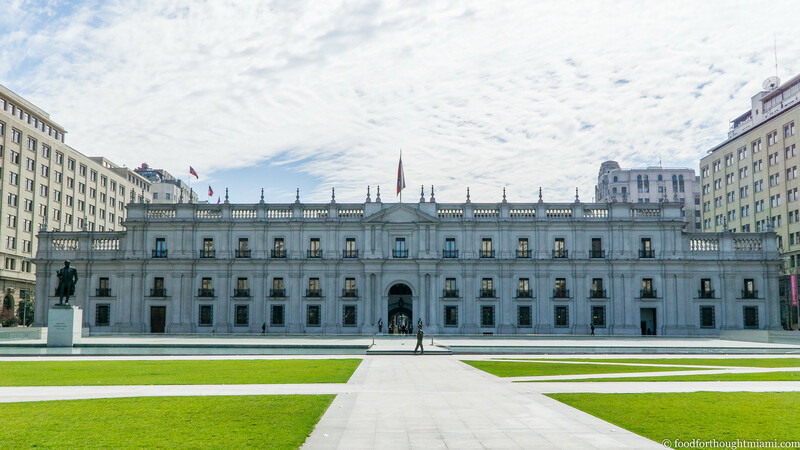 We then made our way across town to the business district that surrounds the Palacio de la Moneda – originally a mint in the early 1800's, and used since the mid-1800's as the offices of Chile's president. (In 1973, the Chilean air force bombed the palace during the military coup against President Salvador Allende). Directly underneath it is a Cultural Center which includes an arts center, a film archive, shops selling local crafts, and a couple restaurants, including a branch of Confiteria Torres, the original location of which is one of Santiago's oldest restaurants, dating back to 1879. 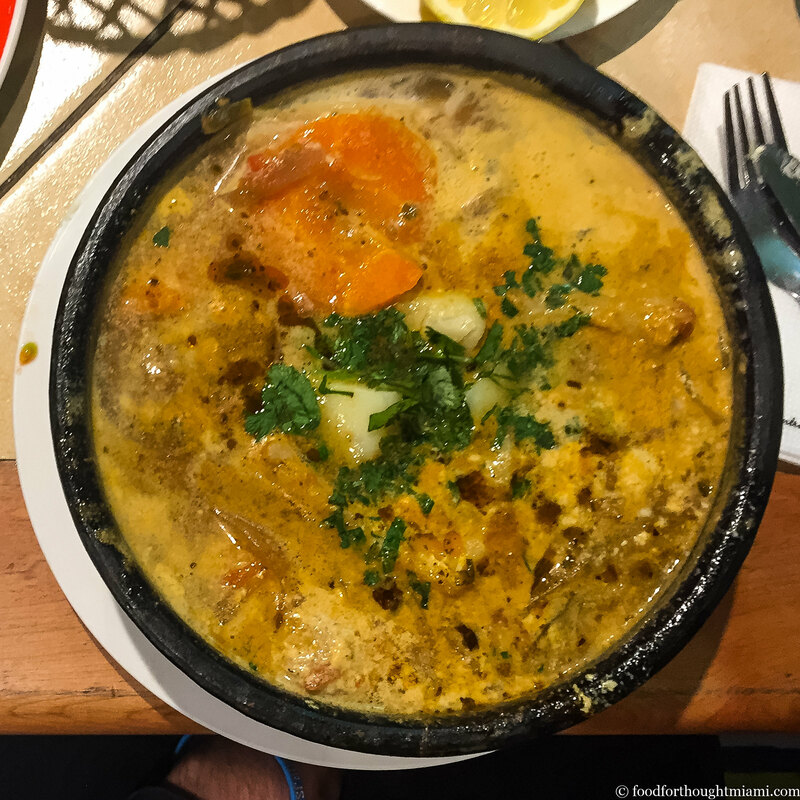 For more than a century, it's been the kind of place where politicos like to lunch: Ramón Barros Luco, who was president of Chile from 1910-1915, would order a sandwich of grilled steak and melted cheese there, and the sandwich is now called a "Barros Luco" not just on the menu here, but throughout Chile. That afternoon, we hopped on the subway to traverse back across town to the Barrio Italia, a neighborhood settled by Italian immigrants in the 19th century. This, I imagine some would say, is the Williamsburg of Santiago. The quiet, tree-lined Avenida Italia is filled with a stretch of stylish storefronts: you can shop for traditional handicrafts or contemporary fashions, scour through antiques or check out custom-crafted new furniture, hang out at a seedy bar or an airy café, even browse the obligatory record store selling vintage vinyl. 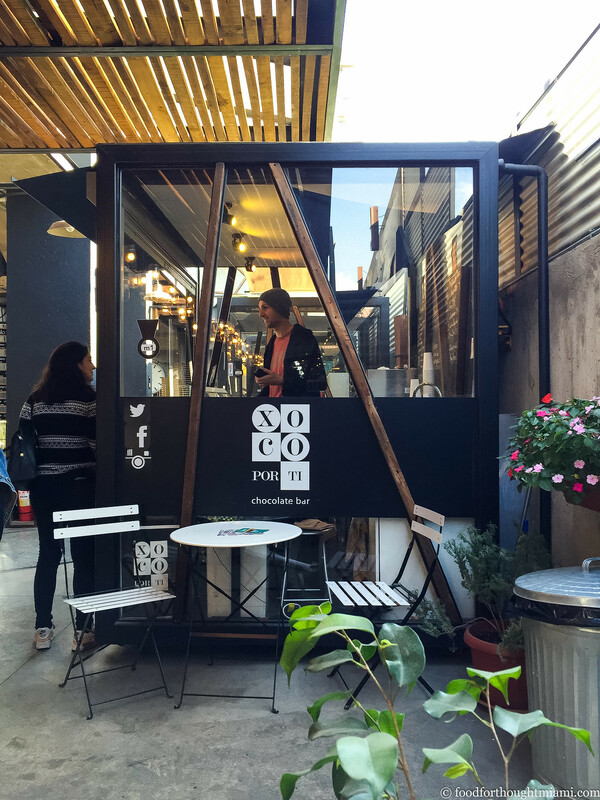 For a pit stop, I recommend Xoco Por Ti, a compact "chocolate bar" tucked into a courtyard among several shops. Here, a "chocolate barista" will whip up a hot chocolate or a frothy, chilled frappe using high quality chocolates sourced from several different origins: Bolivia, Ecuador, Brazil and Peru, They also have several chocolate ice creams with a variety of intriguing additions, like toasted coconut and lemon, ginger and cinnamon, or caramelized bananas. For our last evening in Santaigo, we dined at Restaurante 040, hidden away upstairs in the Tinto Boutique Hotel in Bellavista. That, too will be another post. As will the conclusion of our trip – a few days in the Atacama Desert toward the northern end of Chile. I have to partially correct something I said earlier about Neruda building a house for each of his wives and lovers. While he was indeed married three times, he built La Chascona while Matilde was his then-secret lover; they later married, and he bought La Sebastiana in Valparaiso where they lived together. His house in Isla Negra was originally purchased for his second wife, Delia del Carril.